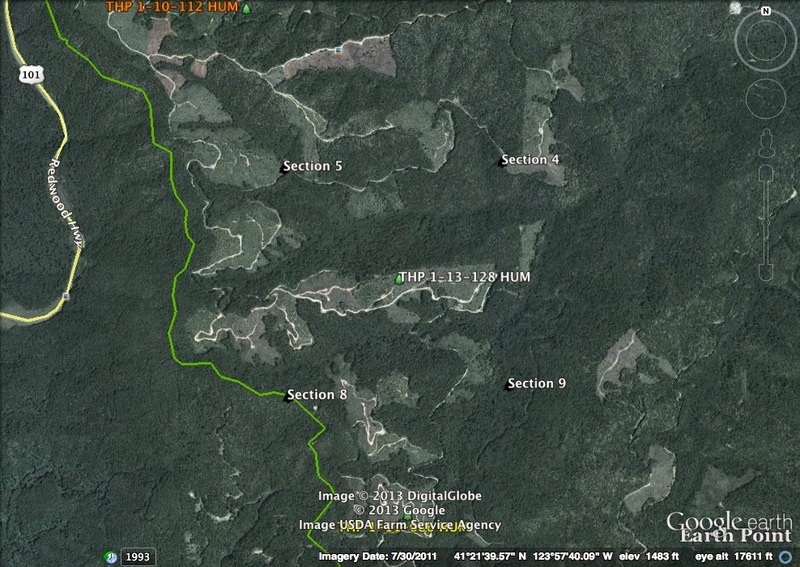 THPBlog: Green Diamond Resource Company to clearcut near Redwood National Park. Green Diamond Resource Company to clearcut near Redwood National Park. This THP is about 6 miles NE of Orick, CA between the Pacific Ocean and Klamath River at an elevation of 680 to 2,080 feet. Units B and D are adjacent to Redwood National Park. Green Diamond Resource Company is planning a mostly clearcut tractor and cable logging operation in Douglas fir, redwood, western hemlock and western red cedar forests. The THP area flows into the Lower Klamath River which is listed as impaired for nutrients, temperature and dissolved oxygen. There are 2 landslide terrain features including a shallow landslide in unit C, and a steep head wall swale in unit D. A marbled murrelet stand is located within 1 mi of the THP area on Redwood National Park lands, and a bald eagle nest is located within 2 miles of the THP area. Pityopus Californicus was found in unit A, and trailing black currant was found in units B and D. There is a spotted owl territory within .25 mi of unit C. More information is available on the THP Tracking Center website.